**Note: Today's forecast contains three important updates. Firstly, an extra mechanism is introduced to try and counter for the traditional overstating of Labour Party and underestimation of Conservative Party support in British polling. Secondly, there are updates to Welsh and Scottish swings to take into account more recent polls. Finally, since we are moving closer to election day, the rolling average function has been tightened from 7 to 5 days. This week, polling averages continued to move in Labour's direction over the week leading up to the Manchester terror attack, and the YouGov poll released last night had the two parties within 5% of each other for the first time in the race to date. The story does now appear to be that Labour are set to improve on their 2015 vote share, achieved under former leader Ed Miliband. The uniform swing model projected the following result from its now 5-day rolling average of current polling: Conservatives (344), Labour (223), Lib Dems (6), UKIP (0), SNP (55), Plaid (3), and Greens (1). 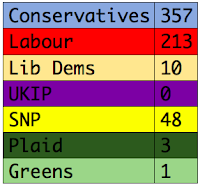 This would constitute an increased Conservative seat total of just 13 seats, and a majority of 38. 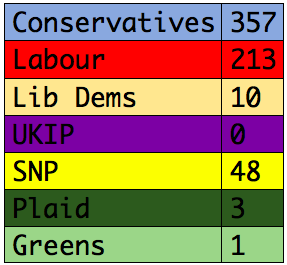 This result would give the Conservatives a majority of 64, with an improvement of 26 seats on their 2015 result. Though an increase, this would certainly not be the sort of outcome that Theresa May would have been gambling on when calling the early election back in April. However, that Labour still find themselves so far behind in terms of seats, despite rallying in the polls and surpassing their 2015 benchmark will be frustrating for the party. The prediction tracking graph below shows how this updated forecast represents a further narrowing of the projected result - and this is despite the inclusion of a new mechanism which certainly gives the Conservatives a boost compared to former predictions. 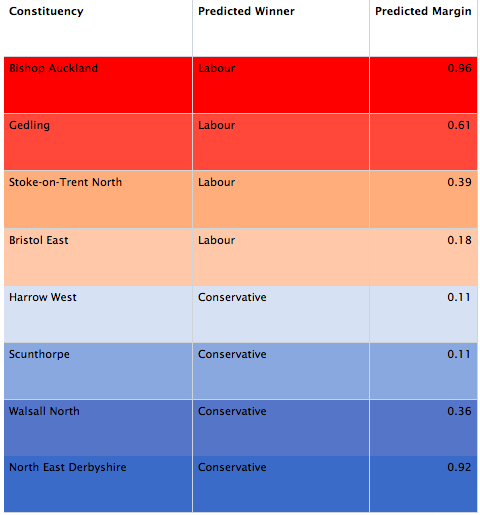 The predicted post-2017 marginals have thus swung back towards the 2015 line, with the current projection returning Bishop Auckland and Stoke-on-Trent North back into the Labour Party column. The line now sits between Bristol East and Harrow West, according to the 'polls plus' model. As campaigns resume and further polling data is released, it will be fascinating to see what sort of impact the tragic events in Manchester on Monday have on the campaign. Will Labour's rise in the polls be halted? Can Theresa May escape the baggage acquired from a poorly received manifesto and associated screeching U-Turns? 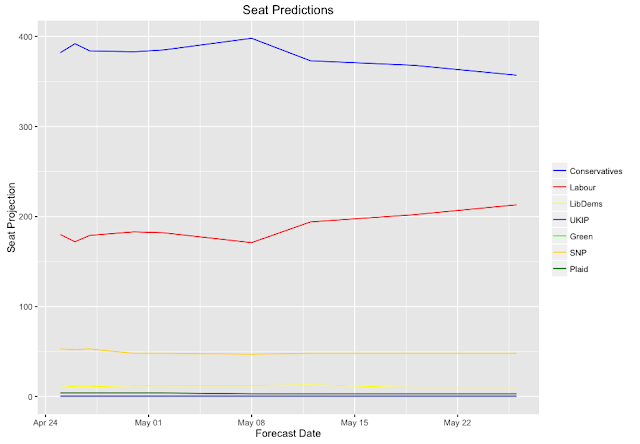 I'm not releasing a seat-by-seat forecast as I'm not confident enough in calling each of them correctly, but rather getting the overall numbers correct (to a point). That said, if there is a particular seat you are interested in, I'm happy to share the model projection for that seat with you (with the above caveat in mind)? Cambridge, Ceredigion, East Dunbartonshire, Edinborough West, North East Fife, Leeds North West, Orkney and Shetland, Sheffield Hallam, Twickenham, and Westmorland and Lonsdale.